I’ve been toiling over all the various things in life available to post and not exactly sure if I have come to a conclusion. There have been quite a few themes playing out of late, all of which generally say this: I never cease to be surprised by just how really messed up I am and how much I feel like I am just starting to learn how to live life…even at 35. There’s a sentence in Norman Maclean’s book, A River Runs through It and Other Stories, in which Norman is describing his brother, Paul: ”"when things got tough, my brother looked to himself to get himself out of trouble." Reading this I felt that uncomfortable sense this could easily be said about me, and it wasn’t meant as a compliment. Contrary to the American ideal that sees self-sufficiency as the gold standard, it is inhumane to operate like this. In essence, (and the gist of the story Maclean wrote) is that these people don’t know how to ask for help and wouldn’t take it if it were offered. And I am among their ranks. It has been the theme of my existence to tough things out on my own. It doesn’t hurt to have a family life growing up that inadvertently nurtured this – for good or bad. But there is only so much independence one can take before he is alone and in need of help. And then asking for help is harder because he doesn’t know what he’s asking. (No, this isn’t a plea, but more a confession). It is something I’m absurdly aware of in life, how I do all the above, and how it isn’t a good way to live. We are communal creatures, created to live and breathe with each other and yet live in a culture that celebrates isolated individualism. Bonhoeffer wrote, ”Let him who cannot be alone beware of community; let him who is not in community beware of being alone” Plenty of people fear being alone and, so, surround themselves with others, but just as many isolate themselves because they don’t know how to be with others. Both individuals lose out, and so do those they call “family.” In the end neither knows how to ask for help in a manner that is life-giving to everyone involved. The human dilemma. But my fault lay in my overly self-sufficient disregard of what others have to offer. 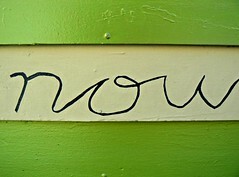 Another theme that keeps coming up of late is something along the lines of learning to be present in the Here and Now. In our Oprah - look-at-your-past-to-overcome-the-future culture that has dwelt far too long on the past such as The Vietnam War and is in a constant state of panic about the future of the economy, earth, country, you name it, it is no wonder we don’t know how to be present with what is right before us. I overheard a guy about my age say, (seriously), “Oh boy, my 401k took a hit this week.” He’s in his early 30s angsting over a retirement plan he won’t have access to for another 30-40 years!!!! I, again, am one of the masses in this regard. And it’s taken so much life away. I spend way too much time beating myself up for failures of my past – i.e. like being overly self-sufficient – or planning out a future that never goes the way I plan. Somewhere in there something is being lost and that is the music of what is happening now. Yet, when I do pay attention to Now, I find my blood pressure is much lower, my guilt is non-existent, and my enjoyment is through the roof. We were not created to live in the future or the past – sorry Sci-Fi nerds. The best things that are happening are right here with the people and the moments in this very breath. And this scratches the surface of all the bits and pieces flowing through my day, lately. Makes it hard to figure out what to say when so much is being said.